The 38.55 metre motor yacht Katrion was sold yesterday with Y.CO representing the seller and Niels Lensen at Arie de Boom in France introducing the buyer. Built in steel and aluminium by Feadship's De Vries yard to a design by De Voogt Naval Architects, she was delivered in 2003 and has been continuously maintained and upgraded, most recently in 2013. Accommodation is for up to 10 guests in four staterooms consisting of a master suite, a VIP suite and two twin cabins with Pullman berths, all with full en suite bathroom facilities. 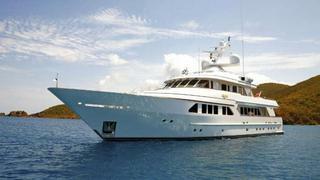 Extensive outside areas offer a multitude of spaces for al fresco entertaining and dining across her three decks. Twin 620hp Caterpillar engines give her a range of 4,300 nautical miles at 9 knots. Katrion was asking €9,975,000. See full details, specs and a photo gallery of superyacht Katrion.